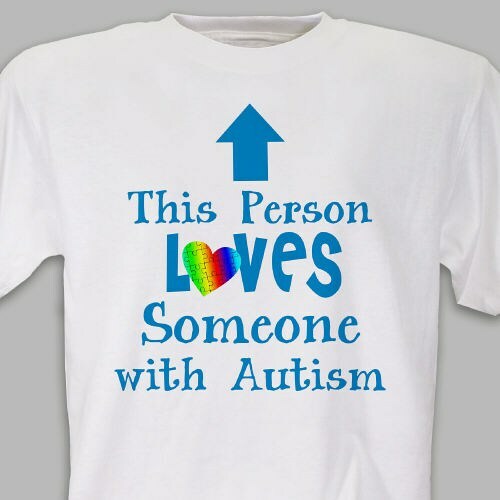 Show the world you love someone who is autistic by proudly wearing this Autism awareness t-shirt. The bright, colorful heart shown in this design resembles joy and optimism and the puzzle pieces illustrate the complexity of this condition. Show your support in every way possible each time this Awareness Shirt is worn. Show your support for Autism today! Our beautiful Autism awareness shirts are available on our 100% cotton white, pink & ash gray shirt, also our premium 100% cotton colored t-shirts as well, machine washable in youth sizes XS-L and adult sizes S-3XL. Additional Info Join in and support the need for continuing research for treatment for Autism and Asperger's syndrome by wearing your Autism Awareness Apparel proudly. You may also enjoy outfitting your entire Autism & Asperger's Walk Team with our Autism Awareness Sweatshirt and our Autism Awareness Ceramic Mug.